Britain’s increasingly reliance on electricity imported from Europe threatens energy security and will import carbon emissions, according to the new boss of the country’s biggest power station. 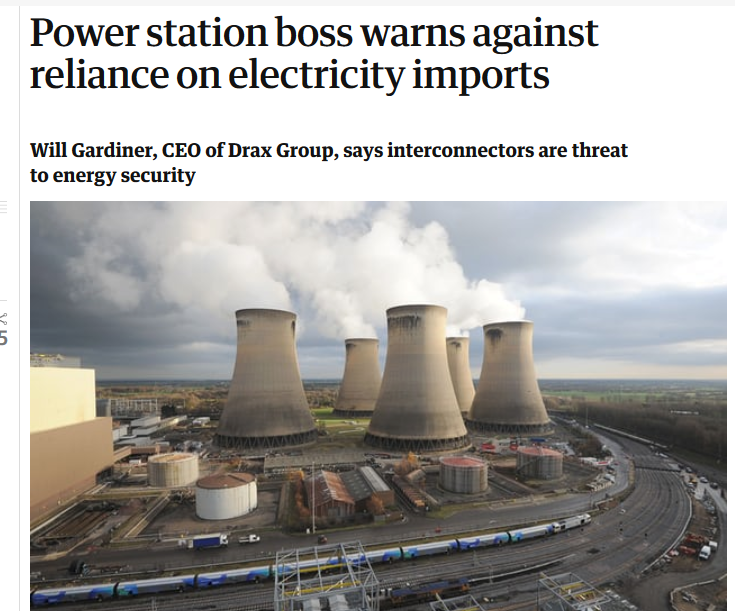 Will Gardiner, chief executive of Drax Group, said that the growing proportion of power forecast to come from interconnectors – physical links to transfer electricity across borders – would also fail to deliver the aims of the government’s industrial strategy. “The hot topic at the moment is what we do about interconnectors,” said Gardiner, who wants to build a vast new gas power and battery storage plant at the company’s North Yorkshire coal and biomass power station. The government expects imports to supply 22% of electricity by 2025, up from 6% last year. A slew of new electricity links are under construction or planned for the next decade between the UK and France, Belgium, Denmark, Norway and Germany. Three of those recently won contracts in a “capacity market” auction of government subsidies for supplying backup power in the winter of 2021-22. That drove contract prices too low to encourage large new gas plants to be built and saw two of Drax’s new small gas power stations miss out on contracts. Gardiner said the prices were a win for consumers, but added that interconnectors failed on other measures. While energy debates are currently dominated by cost, Gardiner said ministers’ priorities were likely to swing back to security of supply, driven by events such as the “beast from the east” cold weather, which put pressure on the country’s energy system. Gardiner said that because the UK carbon price was higher than on the continent, more electricity links meant the UK would be importing emissions. Interconnectors would not help the government’s industrial strategy, he said. Drax wants the government to further “derate” interconnectors in the capacity market, which would see them receive lower financial rewards. Gardiner, Drax’s former chief financial officer, took over the reins at the company in January when Dorothy Thompson stepped down after 12 years, having converted half of the plant to burning biomass instead of coal. In an interview with the Guardian, he said it was increasingly clear that electricity supplies globally and in the UK would be decarbonised by wind and solar. Both technologies had cut costs with “breathtaking” speed, he said, adding that the flexibility of biomass made it a natural partner for renewables. However, he ruled out diversifying into large solar and wind projects, saying other firms were better equipped. Gardiner said the UK’s other low-carbon option, nuclear power, was too expensive. “I am not a fan of sweetheart deals, the government sitting down with Hitachi and writing them a cheque. That’s not good economics,” he said, referring to Hitachi’s chairman meeting with Theresa May earlier this month to discuss a financial support package to build a new nuclear plant. Drax hopes its gas and battery plant project will get planning permission next autumn. But giving the green light on the investment will hinge on whether the company can secure a capacity market contract in an auction in winter 2019. Could this be the same Drax that has a sweetheart deal of £111.29/MWh? We now have a government ignoring shale gas, shale oil and coal while we all watch the rest of the world feast on them, they will probably ignore methane hydrates as well what a bunch of idiots! Yes Paul – I guess it is the same Drax. Although, as much as I hate the whole bio-mass stupidity, government(s) have made it impossible for Drax to do otherwise. Burn coal and we will tax you out of business – burn wood and we will subsidise you to the hilt. Not much choice really is there. Okey dokey, er I dunno, say like importing wood pellets to burn in a converted coal generation plant – what about that? Before we shut our own mines hence OK we imported the coal but coal is a common resource and very exportable commodity, whereas wood pellets is a specialized import…which is the more dodgy idea??? Plus, er notwithstanding the fact that coal is a far better and efficient burn and per ton, produces less ash and CO₂ emissions what about that? I cry in anguished despair these green begoggled and political advocates, mentally ‘stretched’ purblinded dsorts (Gardiner) who argue from a very weak position and on a premise they know sweet fanny adams about. They do strike me as being from the less intelligent part of the community……or descended from thieves and robbers. To expect France to bail us out is like asking Hitler to not bomb us, like I said stupid on viagra. He is obviously a good choice, perfectly in line with the woman who has gone, 11 years too late. Gas plants with batteries? Say what? And “… UK would be decarbonised by wind and solar. Both technologies had cut costs with “breathtaking” speed….” I feel for the UK people. They are going down the same path as Australia. a glimmer of hope. Fracking is now being gently encouraged. Local authorities are being given permission by central government to stand up to the green blob. Yes, we are really in trouble now! Remember folks, it’s by EU diktat that we must achieve (& pay for) interconnection of at least 10% of our installed electricity production capacity by 2020. Note it’s based upon ‘production capacity’ not actual use. So our 12GW of solar operating at 2% Capacity factor in January when most imports will be needed, means we’re lumbered with paying for 98% of that capacity we won’t need. I’ve yet to hear any good news issuing forth out ot the Soviet bloc of western EUropean states, never, never ever. Although, tractor productions statistics are always up and prices for moonbeam technology are going down and down. Meanwhile back on planet earth (maybe), the UK forges (if that is the correct term) probably should say, ‘hurtles’ towards energy policy ‘meltdown’ and all because the loonies (think claire perry/gardiner/Mrs May/corbyn et al) exhorting, explaining, believe that, the green agenda means endless jobs, energy security and and and and and and if you tell a lie often enough……………..and money grows on trees. Unfortunately even after Brexit the UK will follow diktats from the UN on these things, and the UN is the dark force behind all of this. such a depressing retort, but you are quite right and make a good point! The EU’s reasons are not this time stupid – until you get to the renewable bit. is pure lies.More jobs producing something we already produce with less cost (which labour is) means FEWER jobs overall. It has to, because the additional labour just makes energy more expensive, which means just about everything else we consume is more expensive. So we buy less of it and that less requires fewer jobs to make it. So we better not import electricity, but it is fine to import virgin forest to be burnt at Drax. Yes, import the bulky large thing rather than the finished product! That makes SO much sense! Plus maybe a new ‘APP’ for your phone to tell you how much time you have to make a cup of tea before your power is terminated due to lack of generation. The EU, Ed Millabands 2008 climate change act and a continuing host of spineless political animals have & continue to propagandise / restrict this country’s future ability & identity. I still have a couple of paraffin lamps and always a good stock of candles ready. Having grown up in a house lit by gas, paraffin and candle I fear the day when we return to that. Although on the bright side my mother was unaffected by miners strikes and three day weeks, she just carried on as normal. For me the thought living in permanent gloom for 7 months of the year again is depressing beyond belief. Security of energy supply really should be a non-negotiable legal obligation and that means home-generated energy from 24/7/365 reliable, affordable sources. There should be a legal requirement to use the cheapest generation available which means coal and gas. They should be prioritised to ensure UK baseload demand is covered. Virtue signalling can wait. Any party that proposes and delivers on this will find it an instant vote-winner. And where do we get our oil from then? Or is petrol not somehow really important to us? If others have surplus cheaper power, let’s have it. Among American colonists, one of the major issues with the home country was the King’s broad arrow mark on White Pine trees. Isn’t it odd that North American trees are again being cut down for a British use – that will not last. Thanks for the link, very interesting. Let’s hope you’re right that Drax wood burning stops soon! Britain’s biggest CO2 emitter via wood-burning is worried about importing CO2 emissions? No, just promoting its own business. 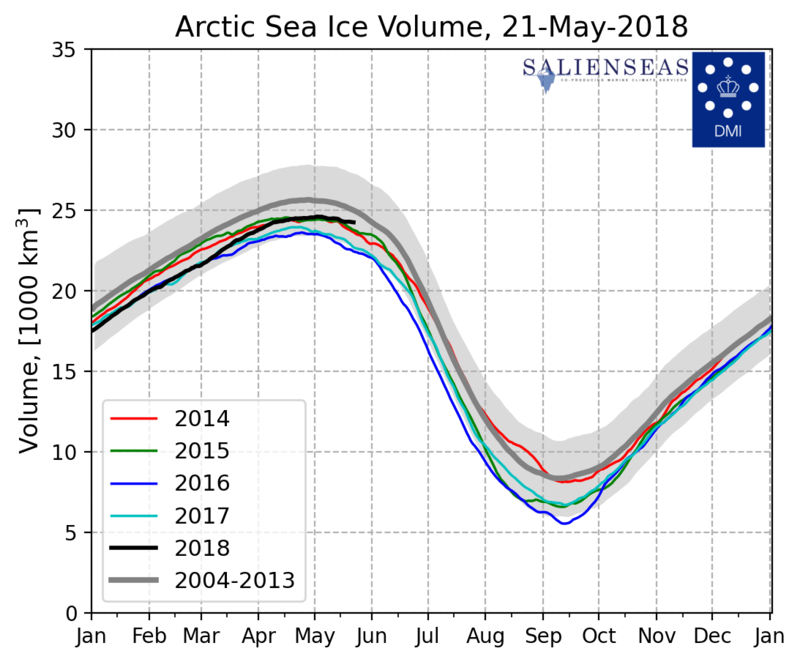 The volume of the Arctic sea-ice is IDENTICAL to that of four years ago. Well thank goodness – it’s a dumb test.Jobs are created by having the cheapest and most efficient way of doing things. And who cares about exports? This bizarre focus on exports by everybody, from the government down is absurd. Imports are what matters, because imports are what we consume. It is increased production through increased productivity that makes us richer, not who sell the things we make to. If I sell my cars for 100 each to people in Leeds or 100 each to people in Lyon makes absolutely zero difference to me, or to the UK. If we do not take care of our balance of payments through import substitution and exports, then we end up selling off or mortgaging our assets – our companies, our homes – to foreigners. We can only do that once, and while we do it, we progressively bleed our domestic economy as interest, profit, dividends and loan repayments go abroad instead of recirculating in the UK economy. We can try printing money IOUs for the foreigners instead, but the result would be a depreciating exchange rate that would hasten the economic crisis.